In order to facilitate your prompt arrival at the pool using the MARTA trains, we have augmented the Georgia Tech trolley system with additional buses dedicated to swim meet athletes, spectators and volunteers. These additional buses will run directly from the Midtown MARTA station to the pool and back on an ~ 8 minute interval during the prime hours of 5:30am - 8:30am, Noon - 1:00pm, 3:30pm - 5:30pm, 7:15pm - 9:15pm. You may also take the Georgia Tech trolley between the Midtown MARTA station and the pool throughout the day. The Georgia Tech Trolleys run on a 12 minute interval throughout the day. When planning your trip from the Host Hotels, plan on your trip taking 15-30 minutes (walk to Peachtree Center MARTA Station, wait for next train, train ride to Midtown MARTA station, wait for next trolley/bus, and bus ride to pool). Bonus Feature Presentation @ Y Nationals… Lifeguards cannot be trained to see what they cannot see! On Wednesday afternoon, July 27th, Poseidon – Our YMCA National Swimming Championship Sponsor - will provide a LIVE demonstration of its Computer-Aided Drowning Detection and Risk Management/Loss Control product for YMCA lifeguarded aquatics facilities. The Lifeguard assist technology demonstration will be conducted at the Sanders Branch of the Metropolitan Atlanta YMCA, which is a 10 minute ride from the Georgia Tech Aquatic Complex with transportation to and from the demonstration site provided. There will be a sign-up sheet for this event at the Swimming Championships registration. If you, or someone assigned can make the time, you won’t want to miss this opportunity to see the latest in advanced drowning prevention technology - an additional layer of protection that complements your YMCA lifeguards' vigilance." Your time won’t be wasted! Unoffical Psych Sheet. All errors and/or changes must be addressed by the coach at coaches check-in in Atlanta. Do not contact or email the Meet Committee regarding any changes to the psych sheets. NEWS FLASH - The Marriott has agreed to continue selling rooms up until the date of the Championship. If you have not made your hotel reservations, you can still participate in the YMCA's Stay With Us Program. 50 Strokes: Entry in the 50 strokes (except 50 free) must be provable 50 time - do not enter a 100 or 200 time for the 50 stroke. Remember, your swimmer must either be entered into a 100/200 event for the 50 stroke or have a provable 100/200 qualifying time. Rather than sitting in the spectator area, be down with the action on the pool deck. We need volunteer timers (experience desired but certification not required) and Level I or II certified officials (YMCA or USA) to adequately conduct a championship of this magnitude. Volunteer today by completing the pre-registration form and sending it to Chet. This year, time trials will be offered at the Long Course Championship. They will be held after the prelim session each day. A swimmer may swim a maximum of two time trials events during the meet. Time trials will have a qualifying standards. These standards are available by clicking the heading above . 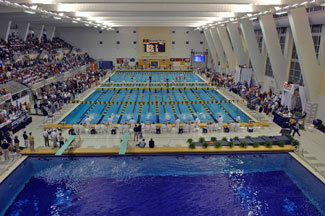 College coaches are welcome at all YMCA National Swimming and Diving Championships. We encourage you to come and see the talent that can be the future of your swimming or diving team. The YMCA National Swimming and Diving Committee recognizes the commitment a swimmer makes to training and competing in swimming and diving competitions. The Committee seeks to relieve some of the financial pressures associated with participation by making matching financial assistance available to the local Y to support swimmer needing financial assistance with traveling to National Competitions. Information, Eligibility requirements and Forms. GT Housing on campus has limited rooms during our Long Course Championship. All reservations go directly through GT Housing and are not connected to the YMCA of the USA.